I haven’t posted in over a week, which isn’t like me! But, as you hopefully read a little while back, our new little venture, Hanky Planky, has been keeping us super busy. And that’s a good thing. But between that, my daily transcription job, a three week cold that turned into bronchitis, my three kids and one of them starting softball (I’m team mom, again! ), I’ve been a tad bit occupied. Aside from that though, here’s a good one for you. You all know my love for Mexican food runs deep. It’s a craving that can never truly be satisfied because I could literally eat Mexican food every day. 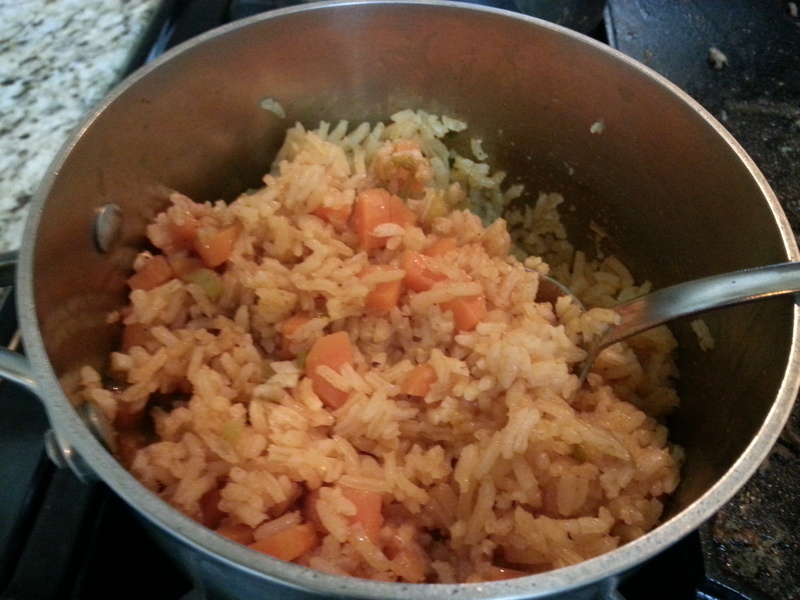 And with this rice recipe, your international meal will be complete! My mom has made this recipe for as far back as I can remember. 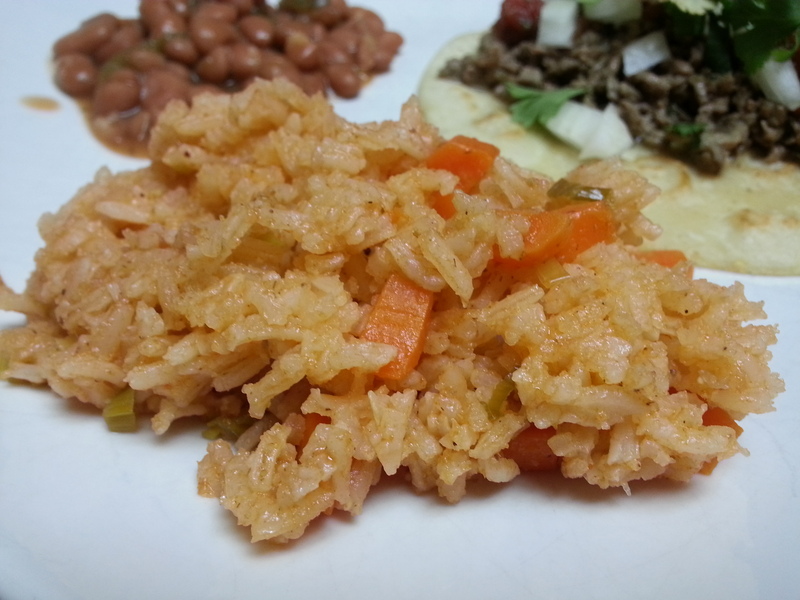 She’s always called it Spanish Rice, but since it’s always served with Mexican food, maybe it’s actually Mexican rice? Whatever it is, it’s so, so good! But, and I haven’t told her this yet (Hi Mom! ), I changed her recipe. Just slightly though! And it was out of convenience that turned into a blessing in disguise. That change is the carrots. 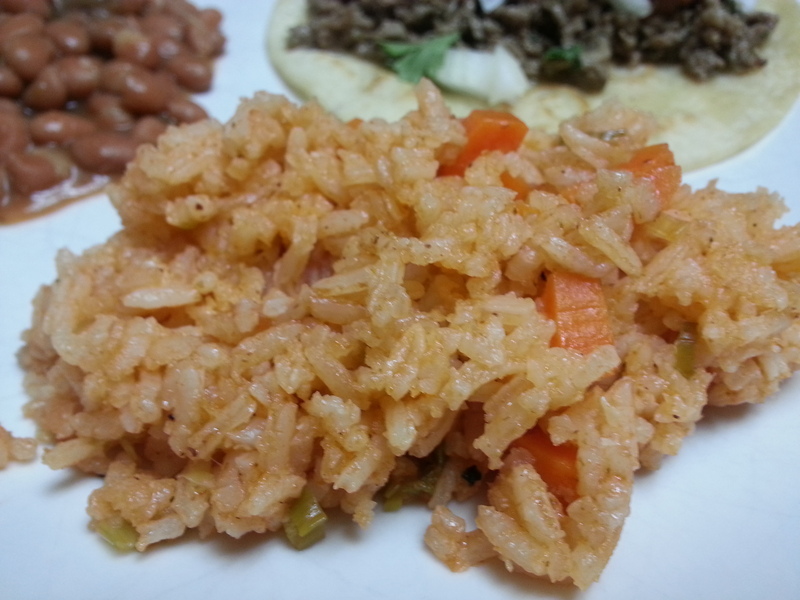 Our favorite Mexican restaurant serves their rice with carrots in it, and they’ve got some pretty good rice. So since the original recipe called for tomatoes and I didn’t have any, I opted to add in carrots in their place instead. And yep, this is the way I’ll make it from now on. Try it Mom!!! In a small to medium pot, heat on medium low. Add the bacon drippings or oil. Once melted, add in the white rice. Stir to coat the rice with the oil. Continue to stir the rice occasionally to keep it from burning. Make sure to keep heat on low, and do this for about 5 minutes. Add in the garlic and salt. Stir together. Then add in the rest of the ingredients. Stir and turn heat up to medium/medium-high. Once it comes to a boil, put a lid on it and reduce heat to low (simmer). Cook for 22 minutes. Stir and serve. Now that you have this recipe and my refried bean one too, what’s stopping you from making an authentic Mexican meal at home? Nothing, so get in that kitchen!